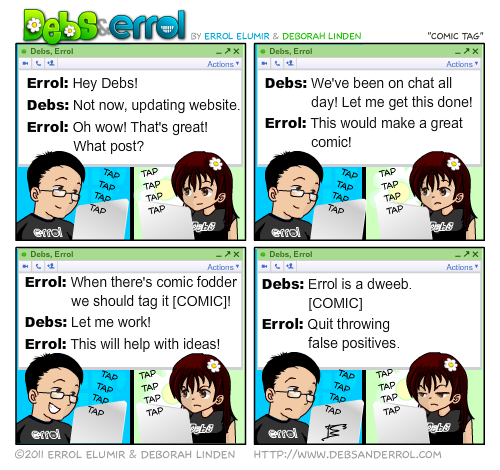 Errol: As I’ve mentioned before, I harass Debs on gmail chat a lot. The reason you don’t see her visible is because she’s trying to hide from me. I did come up with this idea to tag any of our gchat with the [COMIC] tag so that I could search for it later. Until today, when I tried to actually SEARCH for it. Google ignores special characters like ‘[‘. Darn it. So I spent most of the night going through the chats pulling out the things I tagged. I’m using &COMIC tag from now on.